PhraseExpress is even capable of much more since it corrects our mistakes, keep the copy and paste history, launches applications, or web search. PhraseExpress TypoLearn also has the feature that allows to automatically recognize common typing mistakes or frequently used expressions. Each time it detects one, it tells you it just add to all the sentences. If ever PhraseExpress applies a self-correction that you do not want, you can still access the corresponding sentence by clicking the icon PhraseExpress holding down the Shift button. You can then choose to disable or delete sentence. PhraseExpress makes it possible to program advanced macros that automate all sorts of frequent handling. They have extensive documentation, just visit the official website to download and learn on how to use. Download PhraseExpress from official website. This Article Has Been Shared 6225 Times! UN . CO . VER is a free software running under Windows 7, Mac OS and Linux that can detect the sites and pages with content similar to yours. 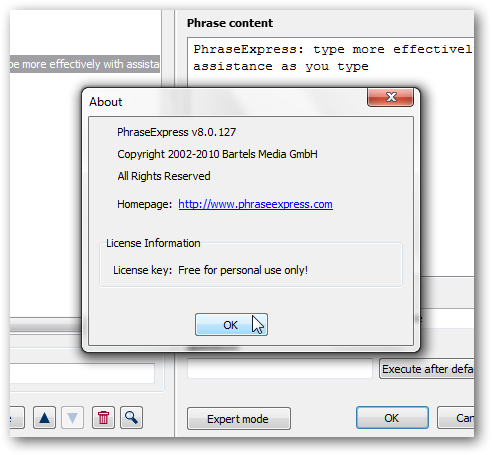 Cite this article as: Abhishek Ghosh, "PhraseExpress: automate typing more effectively with assistance," in The Customize Windows, March 11, 2011, April 24, 2019, https://thecustomizewindows.com/2011/03/phraseexpress-automate-typing-more-effectively-with-assistance/.